Working in the company and conducting meetings as a discussion tool is a very common and very effective way of providing information. There are different ways of such meetings and those are meeting in person or conference call. Meeting in person is a mode of conducting meetings in the company in person, where one stands on the other side of the table and discuss the agenda of that particular meeting. And secondly conference call, conducting the meeting over the phone or cell. Conducting a conference call where in a person holding the main call starts the call and keep adding other participants to it and discuss certain agenda for such conference call. And to hold such conference in a successful manner, a person needs to follow certain steps and they are as follows. While conducting the meeting of any form, a person starts with the introduction of oneself. And even in a conference call a person holding the phone or a person going to start the call needs to introduce oneself to the other participants. The introduction is the first phase of a successful conference call. In meeting in person the one hosting the meeting needs to be accurate with the agenda of the meeting, wherein the conference call meeting a person hosting the conference call needs to be precise, brief and accurate about the data. While hosting the conference call the person who is hosting the call needs to understand one thing first that he/she should be aware of all the details about the other participants. By knowing all professional details about the participants of the meeting will help him/her to conduct a successful conference call. One will be knowing all the ideas to handle such participants and while providing information a person hosting will be aware of how to reach to all the participants of the call. Every conference call is held in a professional and important way to reach all the participants of the call. A proper agenda for such conference is a very vital because a conference call can be held only with the valid reason. It is a very convenient way of attending the meeting. And also a very effective way of hosting the meeting. An agenda of such conference call needs to set clear because one cannot hold the conference call for a very long time. While hosting the conference call, one needs to be very clear with the duration of the call and the content of the call. These two elements of the call can be the main facts of the call. To make a conference call very effective and precise a person needs to highlight certain points of the meeting. This will help in a way where one understands all the key elements of the conference call. By knowing the key elements of the conference call of the meeting will help him/her to briefly explain all the details about the meeting. Unlike all the professional meeting, a conference call should be held in a very precise manner. A person holding the conference call should be clear with the content of the meeting. Because a conference call shouldn’t be very time consuming. A conference call needs to be included in all the details about the agenda. This will help a person holding the call to be very precise about the meeting also very accurate about all the content. A person hosting the call needs to be very accurate with certain points. The main element would be how to start and end the conference call. Every single conference call should take responsibility of the holding of all the participants together. Once a person hosting the conference call start losing the participants then all the efforts he/she have put in to collect all the details would be turned as a waste. Knowing that all the participants are connected through the call in a conference call. By check listing all the participants of the conference call, be sure of the participant who is attending the conference call. All these kind of efforts to make conference sound good, can turn things in a successful way. Conducting a conference call can be an innovative method of grabbing all the attention of the participants without being present physically. 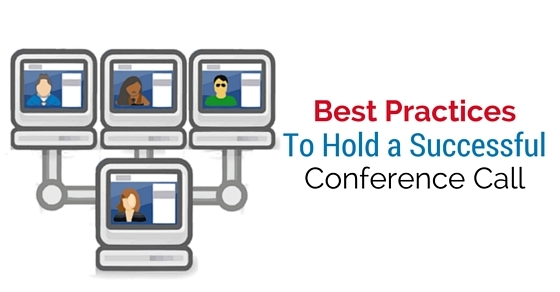 By reminding all the participants of the conference call about the meeting regularly. So that there won’t be any absentees for the conference call. Keeping them posted about all the things of a conference call makes things very important. These kinds of behaviour with such a conference call can be turned as a successful conference call where all the participants are ready to have proceeded. These kinds of things makes a conference call very effective. Sometimes it happens that the person holding or hosting the conference call starts feeling little destructive because of the outside force. To avoid such distracting elements a person needs to understand that the conference call is virtually a meeting held over the phone, but physically a person hosting the call needs to imagine all the participants sitting in front of him / her right across the table. This kind of imagination can help him/her to be focused regarding the conference call. While conducting a meeting a person understand only one thing that he/she conducting a meeting shouldn’t pause in between the meeting. This kind of rule is applicable during the session of questions and answers. If a person pauses in the middle of the question then he/she may be considered as stuck in middle of the meeting. But in the conference call meeting a person should pause in between the call. Pausing can be considered as giving certain thoughts about such an idea. During the conference call, it is possible that a person hosting the conference call may start feeling that he/she is losing the participants’ attention, but if that happens then it is a very downward thing for the hosting person. This means that he/she is not being very interesting during the conference call. This may be a failure of the person who hosted the conference call that he/she was not able to hold the attention of the participants. This will help a person who held the conference call to improve his / her some ways of directing such call. Even this can be useful in the sense of the overall presentation of the meeting. By expecting feedback about the meeting over the phone will be considered to be a very tough thing to do, but if a person excels in that conference call, then it’s not a bad thing at all. It can turn things in a better way and it will be stepping stone for one’s successful career. Explaining certain things in person is a different matter than explaining certain things over the phone. This kind of presentation needs confidence to prepare for. When a person who participated in a conference call pop some questions regarding the conference, it is the duty of the person who hosted the conference call to answer all the questions asked by the attendee. A person holding or hosting the conference call needs to be well aware of the recent developments in the technical facts of digital products. There are certain ways to handle such conference call technically and they are as follows. Once a person starts the conference call he/she should aware of all the technical terms of the telephone. He/she should start with dialing the number and also have to let the other person who involved in the phone know that he/she is going for conference calls. This will help all the participants to know all the details about the new connections over the phone. So that there won’t be any awkward feeling around them. This helps other participants prepare for another new conference call. By tapping on merge calls option, a person hosting the meeting will get connected with other participants of the conference call. This will help a host to be aware of all the new things of the digital world. A person start with a conference call can hold the conference call for certain valid reason. By use of hold options he / she can hold all the participants or just to hold a single participant. Private calls during the conference call is considered as a reference call where a person holding the conference call seek for certain help during the conference call. At that time a person can choose private call option to seek for some help but need to keep this in mind that the private caller won’t be able to be a part of the conference call. A person holding the call can mute him / herself by choosing the option to mute, where the host can be muted on his / her own wish to provide some or to seek some additional help over the conference call. This can be always helpful for those who get stuck in middle of the meeting. A person holding the conference call can also seek some information through the information technology. This can be helpful for those who want to understand new elements added in the conference call. He/ she can access certain applications in the middle of the conference call and this will be kept to oneself without letting others know about it. A person hosting the conference call reject an incoming call without being effected in the middle of the conference call. By choosing such option of rejecting call, one can continue with his / her conference call. To end this discussion we would suggest that the company which is earning good profits should be aware of such technical terms which has been stated above. And every company or the employees who are working in such company needs to be aware of all the new elements of the digital world. This is helpful for their career to be very successful. These kind of information about technology will always help a person to be updated regarding the digital innovations. These kind of digital innovations helps a person to understand the possibilities of one’s career. Conducting a meeting in an office is a common thing, but conducting the meeting over the phone is a very innovative way of conferencing. By conducting such conference call, one can at least get to built some confidence before entering into an actual meeting. This kind of conference call meeting is very helpful in this busy life and one can attend it without being there physically. Therefore, to conduct such successful conference call one needs to incorporate some of the techniques and here mentioned above are all the techniques or steps to follow to conduct a successful conferenece call. By using such practices any one can hold a successful conference call. Previous articleHow to Be a Successful Woman in a Man’s World?